Visions of Jesus Christ.com - Nasreen Jouni - Stigmatist. 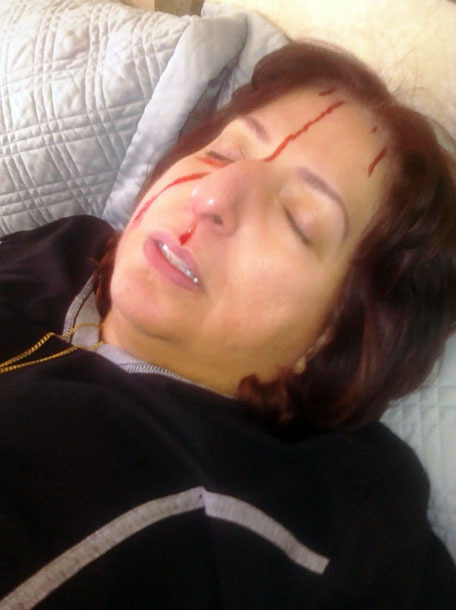 Left photo is Nasreen Jouni with the visible stigmata crown of thorns. Right photo is a Host that miraculously appeared on Nasreen's tongue during an apparation with Jesus. [See/view] photos taken by one of those present at one of the apparitions to Nisreen which she received the Eucharist from Jesus. Attendees witnessed this event and how the Eucharist appeared in her mouth from the air without seeing any hand or material means put the Eucharist in her mouth. Reported in [Spirit Daily.com]. Full article [here]. When it comes to stigmata and alleged prophecy another interesting example that has recently crossed our desks involves a Catholic woman who was born in Iraq. Her name is Nasreen Jouni, 51; her father was from Baghdad, her mother from Basra, and her grandmother, interestingly, from Niniveh. We interviewed her this week. Nasreen grew up in Kuwait under the guidance of a holy nun and entered the U.S. in 1980. She now lives in Hesperia, California. As a child, Nasreen told us, the Blessed Mother came to her in dreams and let her know about events that would impact her family, including deaths that actually occurred afterward. In 1969, when she was eight, a priest showed her the picture of an Italian priest she then sought to communicate with: Padre Pio of Peitrelcina, who wrote back to her three months later, telling her, she says -- as in the case of Teresa Musco -- that he was happy to communicate with someone so young and that "when you grow up you will know who I am because there will be a connection between us." That was the beginning of apparitions that allegedly occurred each day at varying times with messages that involved prayer and fasting. In 1991, Nasreen says the Blessed Mother reportedly appeared to her with two crowns -- one of thorns, one of flowers -- and asked which she wanted. "I told her I would take the thorns for this life and when I die the flowers," Nasreen says. That Holy Week, while in prayer, blood flowed from her forehead. It would also flow from her feet and hands. In subsequent years the phenomenon would start around six p.m. on Holy Thursday or on Good Friday until three p.m. During the experience, says Nasreen, "It is extremely painful. I feel like nails in my hands and my shoulder disconnected from carrying the Cross. Our Lady is next to me as I watch the Crucifixion and we are in a mountain village that is very old and I no longer see anyone else around me, but they say the cries of pain, during the Crucifixion, as I watch, are coming from me -- that I am yelling in pain, and they see the blood come. "The closest I can describe the Lord to is the Divine Mercy image. His hair is brown; His eyes are green and blue -- hazel. When I look at His eyes, I see myself in them. To me He is tall, perhaps six feet (I am short) and His Voice is very deep and masculine. "Our Lady is petite and I never see her touching the floor. She has wavy hair and her eyes are blue like the sea when it is clean. Her face is white but like white skin when it blushes and her voice is like a child's." The stigmata continued until 1996, claims Nasreen, when it stopped for unknown reasons for five years before resuming and continuing allegedly to this day. She also says she experienced a miracle during which a Host appeared on her tongue in front of witnesses. They are certainly controversial phenomena, similar to those of Myrna, who also bled from the face. Nasreen says observers from the Vatican have periodically visited her, starting in 1993, when a nun and priest came to view the oil. We report; you discern. Exercise caution. No mysticism should be approached without fasting. That these mystics are sincere and prayerful is apparent. "My daughter, I know you are weak and I know without me you are always imperfect, unable to move. Don’t worry; I will take care of you. I will take care of you until all my works are done. My chalice of mercy has overflowed. Daughter, when My Mother appeared in Fatima on May 1917, she said the devil asked the Divine Throne to tempt the world for a hundred years. This time is going to end in 2017. He will no longer reign on earth because I will come with My peace. I will cover the world with My peace because, I am peace and passion. My call is to the whole world." She interpreted this not as the end of the world, but as the end of a period -- Satan's time, to be accompanied by major events, for which we should prepare, in ways she believes will be revealed in coming years.